Background: Neuromas are caused by irregular and disorganized regeneration following nerve injury. Many surgical techniques have been described to address neuroma with varying success. 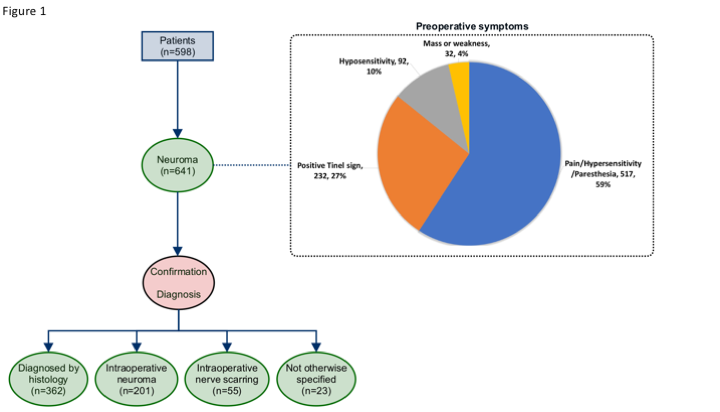 The aim of this study was to evaluate predictive factors for secondary surgery after initial surgical intervention for symptomatic neuroma along with a description of the anatomic distribution of surgically treated symptomatic neuromas. Methods: Five hundred and ninety-eight patients with 641 neuromas that underwent primary surgery for neuroma were retrospectively identified. The diagnosis of neuroma was based on physical examination and patient history in the medical charts. Neuromas were treated by excision, implantation in muscle or bone, excision with direct neurorrhaphy with or without nerve grafting or other treatments. 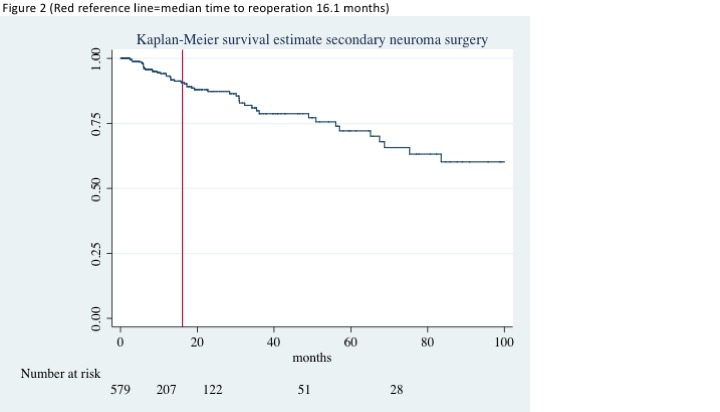 Results: The rate of secondary surgery for neuroma was 7.8% and secondary surgeries were performed at a median of 16.1 months. Excision alone or excision with implantation into bone or muscle had higher rates of secondary surgery compared to excision and direct neurorrhaphy with or without nerve graft. Neuroma were located the in the upper extremity (50%), lower extremity (47%), and the groin/trunk (n=3.7%). Conclusion: Symptomatic neuroma are predominantly located in the extremities and surgery can improve pain with low secondary surgery rates. Excision with direct neurorrhaphy with or without nerve grafting had lower reoperation rates.